Mark Buckley, environmental, health, safety and quality manager for NYCO Minerals at the company’s mining site in Lewis, N.Y.
Green groups in the Adirondacks are split over a proposed land swap that, some warn, would weaken the “Forever Wild” clause in the New York State Constitution. Voters will decide in November whether to approve an amendment allowing NYCO Minerals Inc. to exploit 200 acres of Adirondack Park forest preserve in Lewis, N.Y., about 22 miles west of the Charlotte, Vt., ferry landing. In return for access to what’s believed to be large reserves of a valuable mineral, the company would give the state at least 1500 acres of privately owned land. Five of the six parcels that make up this package adjoin the Jay Mountain Wilderness Area; the sixth abuts the Taylor Pond Wild Forest. NYCO either owns these undeveloped tracts outright or has pledged to acquire them from sellers. “Our Adirondack operations are at a crossroads,” says NYCO spokesman John Brodt. The company’s existing open-pit mine in Lewis contains a dwindling deposit of wollastonite, a white crystalline rock with many industrial applications, including ceramics, friction products, paint and plastics. NYCO expects the mine will be tapped out in three years, Brodt says. And the 100 jobs the company supplies in this section of the North Country could be endangered, he adds, if it isn’t able to exploit the site adjoining its current mine. The proposed land swap has the support of the two biggest environmental advocacy groups in the region: the Adirondack Mountain Club and the Adirondack Council. “We’ll get a lot more ecologically significant land than we’ll be giving up,” says Neil Woodworth, the mountain club’s director. As part of the deal, he emphasizes, NYCO must fully restore the 200-acre woodland site when its mining operations there come to an end in a projected seven to 10 years. “Getting 1500 acres of important wilderness in exchange for 200 acres that will eventually be restored seems like a good deal to me,” Woodworth says. The company is required to fill in the mined area and landscape it with native plants in accordance with the state’s reclamation regulations. It’s actually a bad deal, counters Charlie Morrison, a 40-year member of the Atlantic Chapter of the Sierra Club, which opposes the swap. “Why does the State of New York have to reward a private company by giving it land that is supposed to remain forever wild?” he asks. The trade-off will dilute the 119-year-old guarantee that was added to the state constitution soon after creation of the Adirondack Park, Morrison says. To Dan Plumley, a leader of Adirondack Wild: Friends of the Forest Preserve, the land swap represents a “Faustian bargain.” Yes, NYCO is offering to augment the amount of protected land inside the Adirondack Park, but making such a deal at the behest of private interests would set “a horrible precedent,” in Plumley’s view. New York voters have approved 20 amendments to the Forever Wild clause during the past century, but almost all of them have been for public purposes, not private development. Towns have gotten permission to build roads and expand cemeteries, for example. The NYCO amendment, by contrast, would aid S&B Industrial Minerals, the Greek multinational that purchased the New York mining company last year. Opponents argue that the 100 jobs in economically ailing Essex County aren’t actually endangered. They point out that NYCO holds title to a large untapped deposit of wollastonite that sits less than two miles from its Lewis mine. The reserves at this Oak Hill site could last for as long as 25 years, according to some projections. Plumley says there’s no reason to disturb 200 acres of what he describes as old-growth forest when NYCO has almost equally convenient access to an even more abundant source of the mineral. But the wollastonite beneath the preserved land is believed to be of higher quality than what’s at Oak Hill, NYCO spokesman Brodt says in response. In addition, the deposits at Oak Hill are buried deep beneath bedrock, making extraction of the wollastonite there a prohibitively expensive proposition, Brodt relates. In selling the mineral on the world market, NYCO faces strong competition from China and India, the world’s two largest suppliers of wollastonite, he adds. All that is the company’s problem, not the state’s, the Sierra Club’s Morrison responds. “It’s part of doing business to deal with those kinds of issues. You don’t just try to get easier land to mine from the forest preserve,” he says. A high point abutting the Lewis pit mine affords a dramatic eastward view of Camel’s Hump and other Green Mountains. Mist rises from a barely visible slice of Lake Champlain on a hot July morning. But this is no Adirondack postcard setting. Seen from the lip of the giant pit, Volvo earthmovers resemble insects as they crawl along switchbacks carrying chunks of white rock on their backs. About 20 NYCO employees extract and truck the wollastonite from the Lewis mine. The rest work at the company’s processing plant in nearby Willsboro, which operates 24 hours a day. 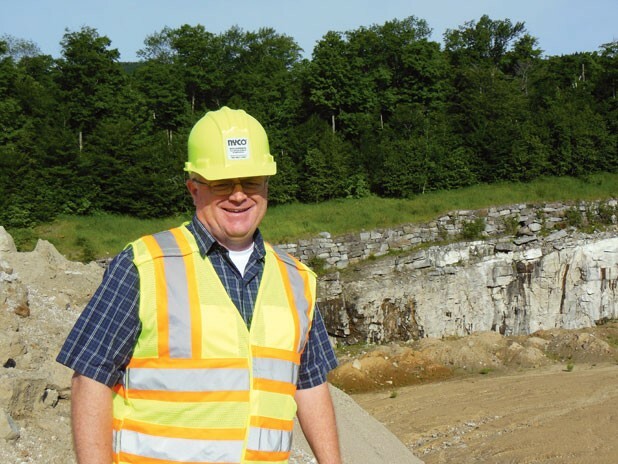 Mark Buckley, the NYCO environmental and safety officer who’s chaperoning a reporter, notes that this mine has been an important component of the local economy for the past 40 years. The company strives to be a good neighbor as well as a jobs provider, he says. “We take the stewardship aspects seriously,” Buckley declares. The company has sufficient resources to conduct a campaign in support of the constitutional amendment enabling the land swap, observes Peter Bauer, head of Protect the Adirondacks, another of the green groups opposed to the deal. “It’s going to be hard to beat them on this,” Bauer concedes, and notes that voters are simultaneously being asked to approve five other constitutional amendments in November — all of which have the backing of Gov. Andrew Cuomo. Voters’ attention will likely be fixed on the controversial amendment calling for a broad expansion of casino gambling in New York state. Plus, Adirondack green groups are generally backing a second amendment to the Forever Wild clause that would enable the state legislature to settle a land dispute in the town of Long Lake. “It’s a confusing set of issues,” Bauer says. Even so, approval of the NYCO land swap “isn’t a slam dunk,” in Bauer’s estimation. Voters in New York City and its suburbs make up the decisive element of the electorate, and, Bauer notes, “downstate voters have historically been skeptical” about amending the Forever Wild provision. The orignal print version of this article was headlined "Almost Forever Wild"